Caroline Reef is a North Myrtle Beach resort that is just a few blocks from Highway 17 in the Crescent Beach section of North Myrtle Beach, South Carolina. This North Myrtle Beach resort is right on the oceanfront near 15th Avenue South. It is a North Myrtle Beach resort that is fabulously designed so that every one of the North Myrtle Beach vacation rentals inside have a beautiful and direct oceanfront view from the living room and private balcony. Indulge your senses in all that encompasses the beachfront lifestyle when you choose Carolina Reef to be the North Myrtle Beach resort at which you spend your next North Myrtle Beach vacation. This oceanfront North Myrtle Beach resort is filled with charming one-bedroom, one-bath North Myrtle Beach condominiums and more spacious two-bedroom, two-bath North Myrtle Beach vacation rentals. Whether you are seeking a romantic getaway at the beach for two people, accommodations for a family of four or enough room for six people, Carolina Reef is a North Myrtle Beach resort that can meet your needs. Carolina Reef is an eight-story North Myrtle Beach resort that is built on stilts, which means the ground level becomes covered parking for Carolina Reef guests. Park the car and at both end of the parking garage are stairs so if you just need to go to the first or second floor you might want to take the conveniently located stairs. An elevator is also available at Carolina Reef for those trips when you must travel to a higher level floor, have an armful of groceries or need to carry all of your luggage into your North Myrtle Beach vacation rental at Carolina Reef. Also on the ground level of this North Myrtle Beach resort is a pool deck. The swimming pool is on the oceanfront so it really sparkles in the sunlight as the sun bounces off the Atlantic Ocean, the pool and the hot tub. There is a kiddie pool on this oceanfront sun deck so the little ones in your family have a safe and shallow place to play. All of the balconies at this North Myrtle Beach resort overlook not only the beautiful Atlantic Ocean and inviting white sandy beaches they also overlook the oceanfront pool deck at Carolina Reef. There are only seven North Myrtle Beach condominium rentals per floor at Carolina Reef. 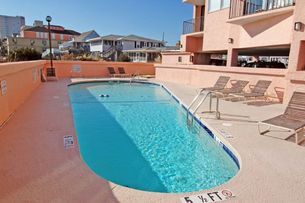 The end units of this North Myrtle Beach resort are the two-bedroom North Myrtle Beach vacation rentals. The interior five condos are all one-bedroom North Myrtle Beach rentals. The floor-to-ceiling balcony doors are fantastic. They let in so much light and offer oceanfront views from throughout most of the North Myrtle Beach vacation rental.